I usually have some leftover gravy after cooking my lor bak. This is my cheater's way of cooking lor mee. Quick and easy. Other ingredients which can be added are fried fish fritters and fried wonton. Cook the fettuccine according to package instructions. Drain and transfer to a bowl. Toss with a little sesame oil and set aside. Heat up the gravy used to braise the pork belly. Add water, soy sauce and thick sweet soy sauce if necessary. Check seasonings and adjust condiments accordingly. 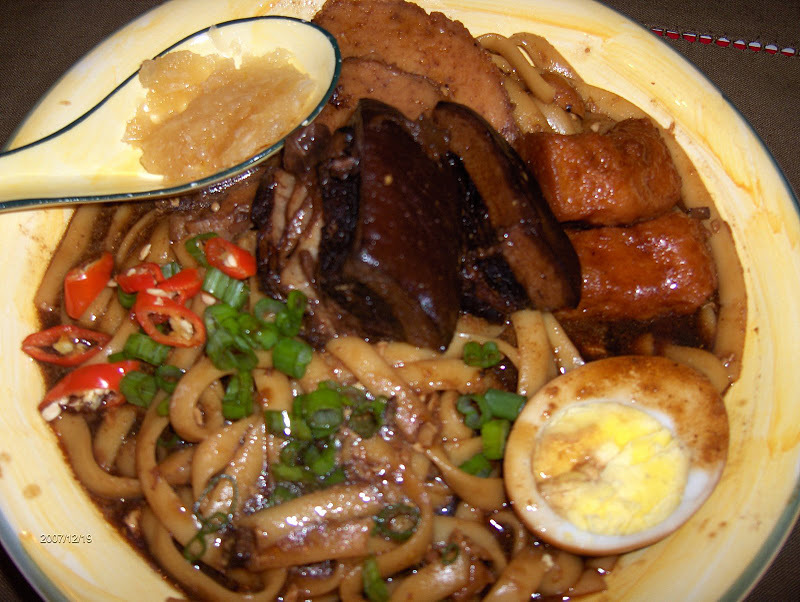 Place the hard boiled eggs, cooked lor bak and fish cake into the boiling gravy and cook for a few minutes. Remove and set aside. Pour cooked noodles back into the gravy. and add a dash of black vinegar. Cover and simmer the noodles in the gravy for a few minutes. Stir in the beaten egg and add tapioca starch solution to thicken the sauce so that it is kind of gooey. Toss to combine well. Ladle noodles into serving bowls and top with the ingredients. Sprinkle chopped green onions, cut red chillies and serve warm with a dollop of grated garlic.